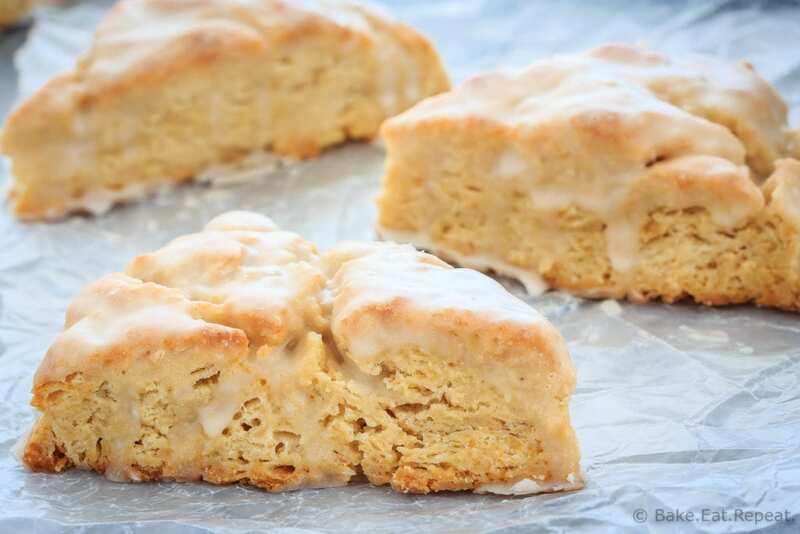 Although really, how did scones ever become a normal thing to eat for breakfast? Let’s start our day with a buttery pastry covered in a sugary glaze. That’s super healthy. But you know what? I’m kind of on board with it. Have some yogurt or a hard boiled egg with your vanilla scone. It’s all good. Or call it morning coffee break instead of breakfast. Then it’s definitely okay, right? I think so. Don’t be concerned when you stir in the liquid and it still just looks like a crumbly, floury mess in your bowl. That’s how it should look. 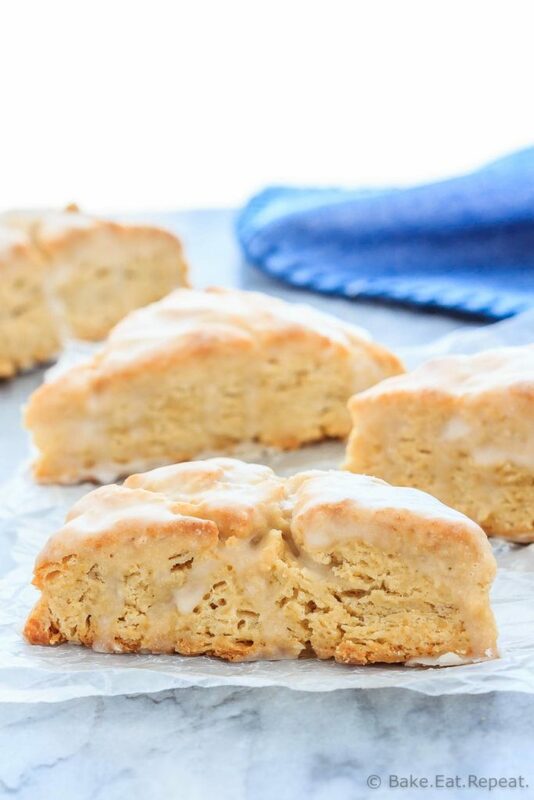 If you add more liquid to make it come together by stirring then your scones will be tough. The trick to perfect scones is to let the mixture be crumbly. Stir it just until it starts to clump together a bit and most of the flour looks moistened. Then use your hands to knead it just a little bit in the bowl and bring most of the dough together, but try not to over-work it. Then dump everything onto a baking sheet and press it all together into a flat disc. It won’t matter that there are still floury bits that don’t look mixed in. It works when you bake it, I promise! If you don’t want to grate your butter, you can use a pastry cutter or two knives to cut the butter into the flour mixture instead. This works just as well, I just find that grating the butter is faster and easier, and it helps keep the butter cold which is important when making scones. When you cut the scones into wedges, make sure to use a sharp knife and press straight down. If you twist or saw through the dough it will seal the edges and the scones won’t rise as well. 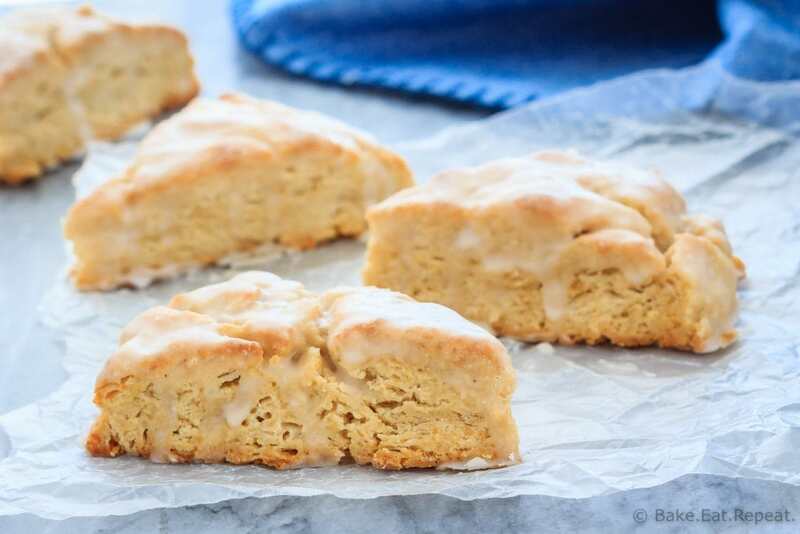 Here are some more great scone recipes for you: Double Chocolate Scones, Pumpkin Scones, and Chocolate Chip Scones. 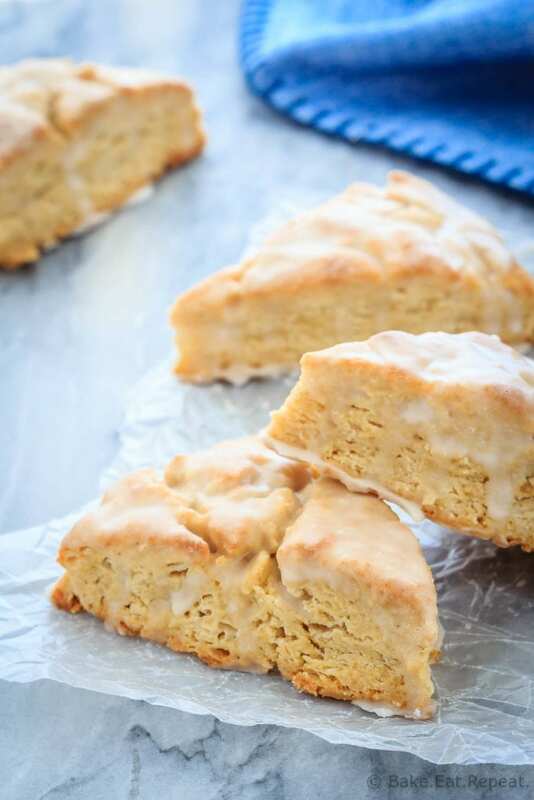 I’ve also shared this Vanilla Scones recipe over on Food Fanatic. This post contains affiliate links. As a Amazon Associate, I may receive a small commission from qualifying purchases.